I’ve had a lot of time to read this summer. That usually doesn’t happen, but with countless lonely hours onboard the Chancellorsville and a month off in North Dakota I’ve had a lot of time to read. Mostly, I’ve been reading nonfiction. 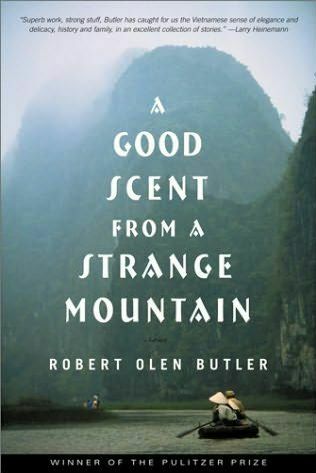 But one of the best books I’ve read this summer – and probably even this year – was A Good Scent From a Strange Mountain by Robert Olen Butler. The book is a beautiful piece of fiction made up of a series of first-person stories, each told from the point of view of a Vietnamese-American. The book is risky because Butler is this middle-class white guy writing about what the Vietnamese people went through after the Vietnam War. But that is what makes the book so great. He captures the spirit of these people and makes the reader believe in their stories. I think it has a lot to do with the first-person narration, but also the risk Butler took in telling these tales. After reading the book, I went on a Robert Olen Butler hunt. I was in Madison at the time and I looked for his other books in half a dozen bookstores throughout the city. I finally found several of his books in the used books section of a Madison Barnes and Noble. I found another collection – Tabliod Dreams – and read the entire thing while in Mankato for a couple days last week. The book wasn’t as good as Good Scent but it was still a good read. So, here’s my question to you, dear reader: What’s the best book you’ve read this summer (or year)? There’s a story in Tabloid Dreams that I absolutely love: Jealous Husband Returns in Form of Parrot. Truman by David McCullough. I’m reading it for the second time and, granted, it gets off to a bit of a slow start, but it’s good. Rain by Kirsty Gunn–okay, it’s not the first time I read it, but I just can’t help myself picking it up time after time after time. The only reading I did this summer was OK, Cosmo, Women’s Health, and Glamor. Oh, I did read half of the first chapter of The Namesake on a train ride back to Brooklyn. Then I had to pack the book. But I liked it so far! ps Amy is coming to NYC! « That troll witch stole Bryan’s hat!